For many years, I have been told that I am a great teacher. In fact, the first time I was told that was my second observation as a brand-new teacher. Ironic considering I did not feel great at all. I was told that I knew what I was doing, that it seemed like I was on the right path. And while it certainly made me happy to have gone through my observation unscathed and even with a compliment, it also confused me. How could I be a great teacher if I was so new? How could I not have things to work on in the classroom? How could this be the epitome of great? So for years, I always hoped for feedback that I could use. For questions that would make me grow. Sometimes ideas were shared, most of the time they were not as administrators were overwhelmed with even more things to do. And so I found my own professional development. I tore myself apart trying to figure out what I needed to work on. I reached out to others so that I could grow. But I always hoped that one day I would work for an administrator that would push me as well. Last year, was my first year as a 7th grade teacher, and my first observation left me sleepless and nauseated. After all, it was pretty clear to me (and the world) that 7th grade was so far out of my comfort zone and was my biggest challenge yet, and there was so much for me to still learn. I didn’t know what to expect, I didn’t know what would be observed that I may have missed, I didn’t know what would be said after. So it was with great anticipation I went to my post-observation meeting with my principal. Anticipation because I longed to be given advice, to be pushed to reflect, to not just be told the good things but to find a path to grow. And I was not disappointed. While my principal pointed out the great, she also asked me to reflect. She gave me ideas that I could try for things she had seen that I had not. She left me articles and emailed me blog posts as she tried to support my growth. That was the first time in 7 years that someone had done that for me. That was the first time that someone said; yes, you have room to grow, even if you are good, and here are some ideas. So to all of you incredible administrators out there, to all of you who observe. Please push us. Please guide us. Please tell us the great, but then also please tell us the things we need to improve on. Give us articles that may help, blog posts, videos, take the time to help us reflect and grow. Make it as big of a deal for you as it is for us. Stay current yourself so that you can pass on the information to others. If you have never taught a grade level or subject that you have to observe, please learn about it. Do not assume that your experience will be enough. Please become knowledgeable so that we can use you as a mentor. Be a role model when it comes to learning and growth and share your knowledge freely. My principal, Shannon Anderson, is the epitome of lifelong learning. She is not afraid to admit when she does not know something, but she will always jump right in with you to find out. And she is not alone, I know others like her, but I also know some that are not. I know I am asking a lot. I know that administrators have so much to do already, and yet, the role of observer and mentor is one to be cherished, one to be nurtured. To have the ability to influence someone else’s professional growth is not something that should be shoved to the bottom of a much too long to-do list. Instead, make it your passion, realize the potential influence you can exert and use that power for good. Being told what to work on was not a slap in the face, not when done correctly, instead it was a chance for me to re-evaluate practices that I had forgotten about. To reexamine some things I thought I had figured out. It was a chance for me to learn. A chance to grow. A chance to not just be great but be better. And better is what I strive for every day. Last week, I had two full days of professional development, or PD as we like to call it. I shared my excitement on Facebook about the two days and, of course, was met with disbelief. Excitement? Really? Since when has PD actually been something to look forward to? And so I realized that I might be in the minority when it comes to excitement for PD, that I might be a lone voice among the educational community and yet, in my district I am not. Because my district, Oregon School District, has figured out how to do PD right. They operate under a few simple things; trust, communication, and choice. Tenets that far too many districts kind of believe in when it comes to PD but then really don’t when it comes to setting the agenda. Yet, my district not only believes it, they live it, and it is apparent every time we are given time to learn as professionals. Our two days consisted of many different things, all meant to fulfill the needs we not only have as a community, but also as individual learners. We started with curriculum time. Just that. No set curriculum to go through. No agenda. We were not even told who we had to meet with. Instead we given the true gift of time to meet with those we felt we needed to meet with. And so we did, and we planned, and we even book shopped as we prepared for book clubs. They trusted us to use our time in the best way possible, in the way that we would see as most beneficial, and so we did. Then we were given small group work time. We have 4 separate professional learning communities happening in our school, so each group met to check in and then as a group we decided what we needed to do. My group had decided it needed time to read the books our school had ordered for us (on our request of course). So we did, we met after and we discussed what we found. Not in order to fill out a sheet, or to check off a box, but because we wanted to learn from each other. The afternoon was filled with whole school learning as a coach came in to teach us how to coach each other and students. 2 hours were spent trying to make our community stronger and more cohesive. While confusion may have arisen from things we did, it still started a lot of conversation. It still gave us tools we could use. It still gave us a chance to learn from each other. We ended the first day with work time for whatever we needed. Again, no need to check in. No need to report somewhere. Just work, get it done, whatever “it” is. The second day had two components to it. The first part of the day being an Edcamp style set-up where we could choose to go to whichever sessions our colleagues were holding, the second being time to work on Educator Effectiveness, our state evaluation system. The morning was fantastic, there were so many sessions, it was hard to pick. And the best part was the variety of the sessions; from discussion of curriculum, to brainstorming, to hands-on projects. From the advanced to the basic, there was room for all. That afternoon we ended our two days with time to do all of the things that our government is asking us to do. Whether it was to meet with our evaluator, meet with a colleague, simply fill out the many online forms, or contemplate how to reach our goals, we were given the time. We were given the tools. We were given the support to be the very best educators we can be. 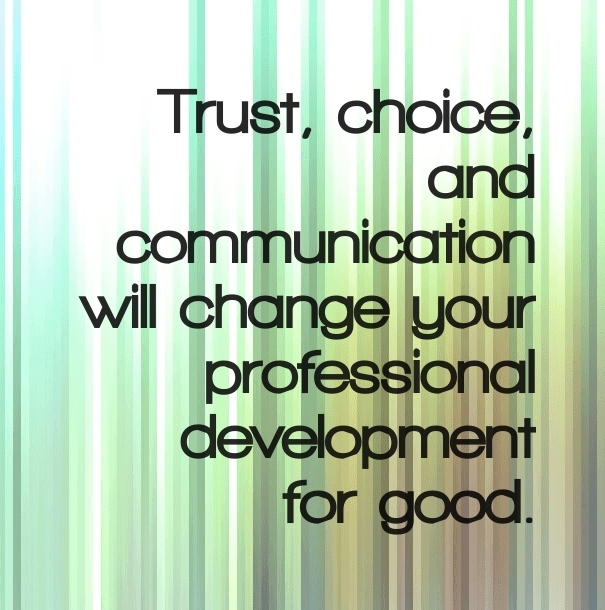 I wrote about trusting staff in my book Empowered Schools, Empowered Students. I wrote about what it could do for an entire district if professional development started to mean something again. I wrote about how a district could actually use these days to honor the talent, the curiosity, and the need of its educators by trusting them. By listening to them. By offering choice. When I wrote that book, I had no idea that I would get to work for a district that lives out this vision every day. I am so grateful that my dream is not just, but actually a part of the tapestry of where I get to teach. PD can be done right, after all. This post is part of a series that the amazing John Bernia and I started last week in order to try to bridge the seemingly great divide there can be between teachers and administration. Please head over to John’s blog to see his counter post. So you want to talk about evaluations? Don’t you know that this happens to be one of my most favorite things to discuss? No seriously. It didn’t used to be that way, not at all in fact, but since switching jobs, I happen to love being evaluated. There is one big reason for that love; I trust my principal inherently. I also admire her a great deal. She is knowledgable, she is honest, and most importantly, she is human. When she is in my room, I don’t feel judged, I feel supported. When she meets with me, I feel like she shares the same purpose I do; doing what is best for kids, and so everything she says I reflect on and try to work through to become better. I wish every teacher had a principal like Shannon Anderson. But the truth is, some don’t. In fact, I had never had a principal actually give me several things to work on before I met Mrs. Anderson. And not because I was a perfect teacher by any means but because in previous evaluations they always caught my class and me on a great day; the show day, where the kids were prepped, I had planned for hours, and everything just worked. One of those days where everything was so smooth it felt like it was rehearsed, and it almost was. That’s what tends to happen when observations are scheduled and never a random visit. When principals are too busy with administrative things to just come by your room. But with new educator effectiveness, the increase in needed observations (which I do genuinely feel bad about for all administrators), we are no longer just being observed on those special days. Evaluations and observations happen all of the time, and I love it. So to answer your question; no, evaluations are not just another thing. They shouldn’t be at least. They should be a chance for you to grow, to reflect, and to question why you are doing what you are doing. Evaluations should be formal and informal and happen as often as possible. I always have an open door policy to our classroom; I am not afraid of what people will see even if it is not a perfect lesson. And that’s it, isn’t it? When we trust our administrators. When we believe that they genuinely care for us, the kids, and the art of teaching, then we lose our fear of the evaluation. When I believe that you, the administrator, has something valuable to add that will help me grow, then I welcome you in. When I believe that you are knowledgable, connected to others, and also a constant learner, then I am ready to listen. So please come by any time. See the amazing things the students are doing and tell me how to become better. I am not perfect, nor will I ever be, so I need help growing. I need questions to reflect on so I can continue to push myself. I need someone who is invested in the art of teaching that may not have the answer to every question but can point me in the right direction. I know it is a lot to ask, but you are right; together we are better if both of us are willing to grow. Dear Administrators, Can We Tear Down the Great Divide? I am not sure I am the right one to bring this up,in fact, I am not sure it is my place to start this conversation. Yet, this blog has offered me a voice that not all teachers have, a place to start a public discussion that is needed. That doesn’t mean I am the best one to bring it up, but here goes nothing. There has always been a divide between administration and teachers it seems. From the poor jokes about going to the dark side to the hushed conversations behind closed doors discussing the latest admin “screw up,” it seems that there is an invisible mountain between teachers and administration that both sides don’t understand the origin of. It is not that anyone wants to think of the other as being on another side and yet it crops up in conversation time and time again. But I am starting to wonder why we all seem to be okay with it. It seems to just be an accepted fact when I don’t think it should be. After all, are we not all trying to educate the same children? So what is it that is creating it, and more importantly what can we do? Because I hear over and over that teachers don’t think their administration will believe in whatever idea they have, or their administration won’t give them permission, and I am always left wondering if this really is true. Do they really know that or is it just an assumption? In fact, how often do we assume what someone else may say or think and thus feel defeated? How often do we blame our administrators for something when we don’t know if it is really their fault? How often does our own fear of having a courageous conversation create unintended barriers? Perhaps the divide has to to do with trust. While I believe almost all administrators trust their staff, I wonder how often that is explicitly communicated. Not just in words but in actions. I wonder how many times trust is assumed rather than discussed, how many times both sides assume that the other know their intentions. What if we decided that the other side couldn’t read our minds and instead started asking questions? What if we were told that administration trusted us in both words and action, would that break the divide? What if teachers started to tell their administrators that they trusted them, what would that do? What if we gave second chances? What if we, every day, gave each other a new chance at doing what is best? What if we actively tried to create a community of educators just like we work on it with our students? What then? I don’t know what the answer is. I am not an administrator, just a teacher who wants to find a solution. So dear administrators and other educators reading this, what do you think? How do we tear down the great divide? What can I tell all those teachers who feel like their administration will never trust them? Who feel like their administration will never understand what they do, what they are trying to do, and who feel no one has their back? Because I don’t think it’s true but maybe I am wrong, I have been wrong so many times before. PS: I am absolutely loving all of the great conversations that are happening due to this post. Here are a few responses to the post on other blogs. There seems to be a pervasive undercurrent of jealousy within education. Ask most educators and they will have a story to share of how they didn’t tell others about about an accolade they got, an award they were nominated for, or even praise they had received. Shying away from the positive lime light can sometimes feel like a national sport for teachers. Yet, I am surrounded by people who want nothing but the best for each other. I have been before. So why is still that we tend to hide away our accomplishments, rather than share them with those we work so closely? Why is it we downplay ourselves so that others may not get jealous? But more importantly, how do we change the culture within our schools that seems centered on a “gotcha” mentality, a negative one where tear downs are the norm, to a “good for you” community where all receive praise, and no one has to hide what they do. Working in my district, Oregon School District, that goes out of its ways to share the feel good, has given me a few ideas. Some I have heard about from amazing colleagues, some I have experienced, and some I hope to experience. All of these ideas are simple. All of these ideas will make an impact. It is up to us to change the culture within our schools. It is up to all of us, not just administrators to create an environment where we genuinely are happy for one another, not wonder why that person gets all of the attention. Taking 5 minutes to acknowledge. When an administrator or colleague takes the time to stop by and say great job, congratulations, or I have noticed that…it changes the way we feel. Taking 5 minutes to actually acknowledge someone else every day, or even just 1 minute to shoot an email, can create an incredible change, and it starts with the superintendent. When my students and I were featured in an article in our very small paper, my superintendent sent me an email thanking me for shining a positive light on all of the great work that happens in our district. I have never received an email like that before and I can tell you, it made me smile., and it made me want to pass on that feeling. No matter how busy you are, take 5 minutes every day simply to thank people for what they do. The staff restroom gratitude poster. This idea comes from another school in my district. Every Monday someone (perhaps the principal) leaves a poster in the staff restroom with a heading such as “Tell me all of the reasons we are thankful Mrs. Anderson is a teacher here.” Next to it is a marker encouraging everyone to add their thoughts, and boy do they ever. As one of my friends told, this little poster is a ray of positivity in everyone’s day as they get a chance to express their gratitude and see what others say. Every week it is a new staff member, every week no one knows who put it there. The sneaky student compliment paper. Today, I had every class write compliments to one of our team’s teachers. My team had no idea I was doing this which made it even better. It took me less than a minute to explain to the students who then quietly circulated the paper around filling it with gratitude for that specific teacher. At the end of the day, I gave each paper to their respective subject. The “I have noticed…” Vox or email. I know a lot of principal that are on Voxer even if their staff is not. This idea is courtesy of Leah Whitford, an incredible principal in Lancaster, WI. As she walks through the school, she will quickly vox herself (Voxer is a free walkie talkie app for your phone) whatever she has noticed about someone’s classroom. At the end of the day she can then email the audio recording to that teacher. They don’t even have to have Voxer to get it. If you are not on Voxer (which you may want to be), how about a quick two line email. 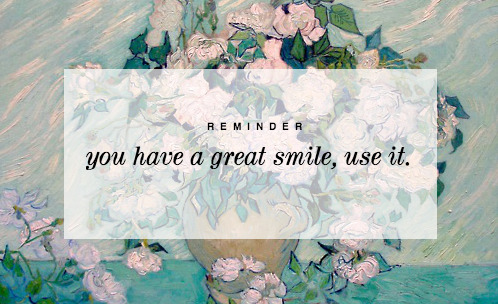 We often don’t know when someone sees something great happening, think of how powerful it would be to get a quick compliment like that. The applause section of the newsletter. This is an idea from my principal, Shannon Anderson, who is a driving force of positivity. Every Sunday she sends out an OMS newsflash that includes information about upcoming events, her schedule, a great article, as well as an applause section where she highlights small and big things that people deserve praise for. Anything from winning an award to helping others out gets highlighted, and she encourages us to submit names as well. Too often recognition only comes from huge events that happen to few people, it is vital that all of the little things that make our school run also get their day in the sun. The compliment cork board. Hang a cork board in the office, put note cards next to it, add markers, and voila – the compliment cork board. Encourage parents, students, or staff to leave a quick compliment for anyone they choose. Think of the message that sends to any visitors that enters your school as well. Be a model of praise yourself. I try every day to thank someone, acknowledge someone, or praise something I have seen. It doesn’t happen every day, but it happens more days than not. Change starts with us, so if we want to work in a culture that celebrates the accomplishments of others then we need to step up to the challenge. Remember; it only takes person to take the first step. I am a passionate teacher in Oregon, Wisconsin, USA but originally from Denmark, who has taught 4th, 5th, and 7th grade. Proud techy geek, and mass consumer of incredible books. Creator of the Global Read Aloud Project, Co-founder of EdCamp MadWI, and believer in all children. I have no awards or accolades except for the lightbulbs that go off in my students’ heads every day. 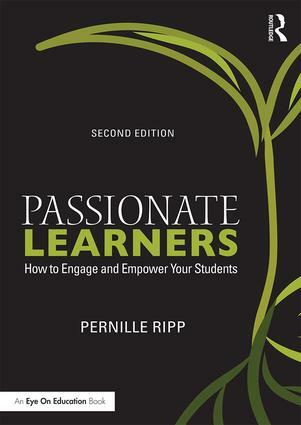 The second edition of my first book “Passionate Learners – Giving Our Classrooms Back to Our Students” will be published by Routledge in the fall. Second book“Empowered Schools, Empowered Students – Creating Connected and Invested Learners” is out now from Corwin Press. 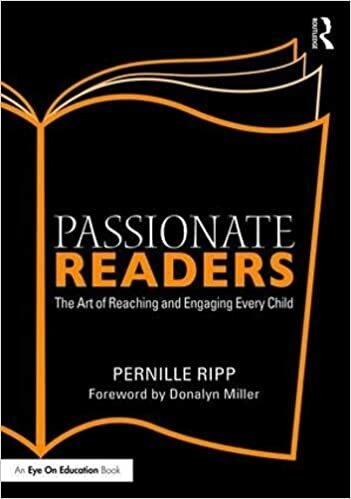 Join our Passionate Learners community on Facebook and follow me on Twitter @PernilleRipp. I gave up putting on a dog and pony show for my observations several years ago. I had reached the pinnacle of coaching, asking my students to please be on their best behavior as I was being observed, bribing them with treats if they would just be great when my principal walked in. After that observation, where I received nothing but accolades for my classroom management – yeah for bribing – I realized that I had to change. My attitude had to change, at least when it came to being observed. Yesterday, I invited my phenomenal principal into my craziest class. Not as a stop by visit, but as my second official observation for the craziness that is Educator Effectiveness, or the way my teaching quality will be known here in Wisconsin. I invited her in to see how I am trying to harness the energy of these students, how I am trying to wok with their behaviors, tap into their quirks, rather than smother them by yelling. And yet, I wanted throw up before she came into the room. Even after 7 years and some months of teaching, having a principal in my room makes me so nervous. I thought of calling in sick. I thought of changing the time of the observation so she would see that one class where all of the kids need little direction, that one class where every plan always works out. That class that makes you look like an incredible teacher even though you know that it is not really because of what you are doing but because the kids are so well-behaved. That’s the class I would have been observed in a few years ago. And I know exactly how that observation would have gone; great praise, little feedback on what to work on because everything was so wonderful, meaning no growth for me. But I didn’t, I forced myself to follow through with my plan, hoping that things would work out alright. Hoping that my students would at least attempt what we were doing not just give up, settle in after only about 5 minutes, and perhaps even have a great discussion. I held my breath the entire time. Yet, as I sat teaching the mini-lesson, noticing how a kid that should have been writing was instead tapping his pencil playing songs, another kid had their head down, and another kid would not stop talking, inwardly cringing as I saw my principal noticing too. I realized something; all the other students were working. The 5 that sat in front me coming up with such great ideas. The 2 that sat and whispered together pointing to their paper. The kid with the pencil listening in to what I said in my mini-lesson and yelling out “Now I get it!” and then started to write. I noticed those moments too. I noticed our classroom functioning in its typical way, and I noticed that for those kids, the tapping, the whispering, the staring blankly; it works. So the next time I am observed, I will invite once again to the class that hangs by a thread. To the class that I know pushes me the hardest. To the class that keeps me up at night. My principal is here to support me, to guide me on my journey, not to just clap her hands and tell me “Great job!” If I don’t invite her into the class where I need her ideas, then I will not grow, and growing is what we all need to do every day, every opportunity. Never will I go back to bribing a class. Never will I prep a class beforehand. Never will I ask a class to please behave because I am getting observed. I will instead teach my heart out and wait for the feedback, hoping that among the chaos, my principal sees the greatness that I see, and can help me further my teaching. Will you? PS: I was worried my students thought they had to put on a show until a kid asked me if he could please continue to work on the science project he had been working on instead of reading. Nope! They hadn’t changed even though the principal was there.